INDUSTRY.co.id - Jakarta, Efforts to meet the energy needs, especially for industrial gas in the region of Northern Sumatra (Sumbagut) continues to be done Pertamina Group. Through its affiliates, PT Pertagas Niaga is currently manufacturing the industry in Kuala Tanjung, Batubara District, North Sumatra, and successfully utilizing gas to meet its energy needs. PT Domas Agrointi Prima is one of Bakrie Group's lines of business which became the first company in Kuala Tanjung, which successfully supplied Liqufied Natural Gas (LNG) with isotank truck transport mode (LNG trucking). "In mid February, we have successfully delivered LNG to PT Domas Agrointi Prima, Bakrie Group," said President Director of PT Pertagas Niaga, Linda Sunarti in Jakarta (22/2/2018). The allocation of LNG is obtained from KKKS Chevron IDD Bangka, Bontang which then shipped to Lhokseumawe, Aceh. LNG is then distributed through Filling Station in PT Perta Arun Gas to 40 Liters of LNG truckload (0.76 MMSCF) and delivered directly to industrial area in Batubara Regency, North Sumatra. "It takes at least 16 hours to travel 470 km from Lhokseumawe to Kuala Tanjung," said Linda. 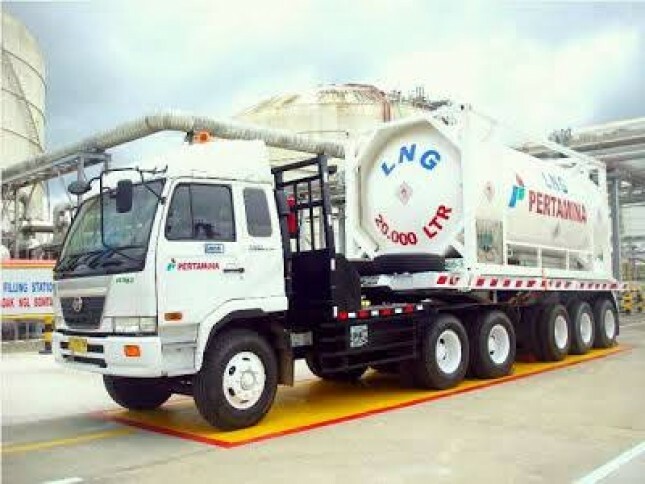 The target of LNG consumers through isotank trucks, according to Linda, is industries whose territories are not yet connected by the gas distribution pipelines. Many industries need gas supply in Sumbagut region so LNG trucking is expected to stimulate the growth of industries that need gas in the near future. "This LNG trucking mode is the most appropriate as a bridging before they get gas through distribution pipelines, and Pertamina is the first pioneer in Indonesia," said Linda. Gas supply through LNG trucking is not the first time done by Pertagas Niaga. Previously the same pattern has been done for industries in Medan Industrial Estate III, Kalimantan Island and Eastern Indonesia. In addition to industry, LNG trucking is also utilized by PLN for power plant needs. "The future trend of gas supply in Indonesia will use LNG in order to reach remote areas so that there is an equal distribution of energy throughout Indonesia," explained Linda further. The LNG trucking project has been initiated by PTGN since 2015. It is estimated that by the end of 2018, consumers need to use LNG trucking of 5,000 MMSCF to be supplied through Arun and Bontang points. "The plan in the near Pertamina will also increase the supply point of LNG in Java," Linda closed. PT Pertagas Niaga is a subsidiary of PT Pertamina Gas (Pertagas) which operates in the field of gas trade through gas pipelines, Compressed Natural Gas (CNG), Liqufied Natural Gas (LNG) as well as City Gas. PTGN gas supply is obtained through PT Pertamina EP, PT Pertamina Hulu Energi and other KKKS.